The short of it? 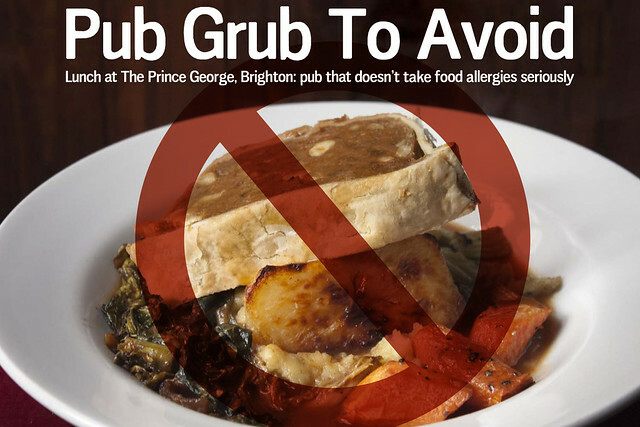 I won’t be going back to The Prince George again, not because the food was horrible, but because but because I think I’ve got a difference in opinion regarding what constitutes acceptable practice in the restaurant business. As in it’s not cool to serve nuts to a customer with an allergy after saying the dish doesn’t contain nuts. And yes, she had to go to hospital. I think this is something the general consumer would be interested in hearing, and should hear. I’m vegan and so are a lot of my readers. Some have gluten or dairy intolerances, others have nut allergies, and I’m sure there’s a whole realm of no-go food areas I’m missing that would send some of you into hospital. My point, of course, is you understand how big a deal it is when you’re told something is suitable when it’s quite blatantly not. The George has switched hands a couple of times over the last year or two, or so the rumour mill has it anyway, and its reputation took a dive as a result. From popular vegetarian pub to non-vegan-friendly gastro pub, it’s now got a much more vegan friendly menu under its latest management. This place used to be one of Brighton’s best, so we wanted to give it another chance, with the genuine hope it would be restored to even half its former glory. I can’t fault the presentation, and for pub grub it was average. I’d almost go as far as saying it was palatable. As someone who eschews animal products, I’d be incredibly upset should someone feed me one. The thing is, it wouldn’t kill me. It would be morally reprehensible, sure, but I’d get over it. Feeding nuts to someone with a nut allergy doesn’t work quite the same, however. That’s messing with someone’s life. If this pub doesn’t place food allergies at the top of its priority list then I don’t trust much else they have to say either. For this reason I’d recommend people avoid The Prince George in Brighton. I can’t comfortably eat a meal at an establishment that can’t get something as basic as food allergies down because, on top of being flat out wrong, it makes me wonder what else they’re not telling me. After being sick 3 times in the pub toilets, we left so my friend could go rest. An hour later they had to go to A&E. She was very ill, all over an elementary error that could have and should have been avoided. * who gave me permission to blog about this only if I mentioned that she’s really, really pretty. I might add her dance moves are also sweet. So horrible!!!! I recently got sick from eating supposedly gluten free toast at a cafe so feel her pain, although at least my allergy has no chance of being fatal!